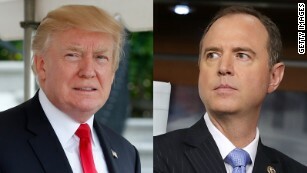 House Intelligence Committee Chairman Adam Schiff has hired officials with experience at the National Security Council to help with his panel's oversight of President Donald Trump's administration , according to a committee aide. The aide declined to say how recently the newly hired officials worked at the council, whether they served under Trump or to identify the individuals. But the move appears to have enraged the President and some members of his senior staff, who view the move as an intrusion. It comes as Democrats prepare to wield new investigative power after winning a House majority in 2018. Trump fumed on Twitter Thursday about the recently launched investigations led by the Democratic intelligence chair and suggested he was raiding the White House staff. "I hear other committee heads will do the same thing. Even stealing people who work at White House! A continuation of Witch Hunt!" Trump wrote. Later, the White House implied Schiff, who announced a sweeping investigation into the President and his finances this week , has recently hired or is interviewing officials from the administration to work on his committee that is now investigating the President. An administration official told reporters to "ask Adam Schiff what that means" when asked about the President's claim Democrats are "stealing people who work at White House." A House Intelligence Committee aide responded, telling CNN the panel has hired individuals with experience on the NSC staff and that it would not discriminate about hiring individuals from the current administration. But the aide said no recent hire came directly from the White House. "We have hired staff for a variety of positions, including the committee's oversight work and its investigation," the aide said. "Although none of our staff has come directly from the White House, we have hired people with prior experience on the National Security Council staff for oversight of the agencies, and will continue to do so at our discretion. We do not discriminate against potential hires on the basis of their prior work experience, including the administration." Schiff's office declined to comment on whether any individuals from the Trump administration have been hired, leaving open the question of whether hires from the National Security Council worked under Trump or another President. Schiff himself declined to confirm any new hires on Thursday, but said the intelligence committee had a "long tradition of hiring out of the intelligence community, out of the National Security Council." "If the President is worried about our hiring any former administration people, maybe he should work on being a better employer," Schiff said. The moves come as Schiff and other Democrats prepare to launch new probes into Trump, leading to concerns inside the White House that some career staffers opposed to Trump's policies may use the opportunity to damage him. Trump and his loyalists have long been skeptical of career officials inside the government, some of whom they claim are out to stymie his agenda. Some officials have used the term "deep state" to refer to staffers burrowed in agencies and departments who they claim are actively working to block Trump's directives. Those concerns seem to be heightened by a surge in congressional investigations launched after Democrats assumed control of the House. A person familiar with the matter said former National Security Council staffers would not be out of the ordinary on the intelligence committee. At least two Democratic staffers working on Schiff's staff also spent time at the National Security Council, and Rep. Devin Nunes, then the Republican chairman of the committee, hired former National Security Council Middle East director Derek Harvey in September after he was dismissed by then-national security adviser H.R. McMaster.